Last year around this time I did a Pinterest Picks about Easter Decorations, but this year I’m focusing exclusively on Easter eggs. I don’t have many memories of decorating Easter eggs as a kid beyond dipping hard-boiled eggs in food dye. Frankly I didn’t care about decorating the real eggs, I was all about the hunt for the fake plastic eggs. Easter egg hunts brought out my competitive side and for me it wasn’t about what was inside the eggs, it was about being a better egg hunter than everyone else. This year I’ve come across too many cute Easter egg ideas on pinterest and tumblr that I had to share them with you. Beyond food coloring, these ideas take egg decorating in different directions, most of which involve gold. What can I say? I’m digging all things gold, especially the gold and copper leaf used on eggs in tandem with the usual Easter color palette. Some of these egg “recipes” call for string or Washi tape. What a good idea! I always forget to use Washi tape for little projects like this. 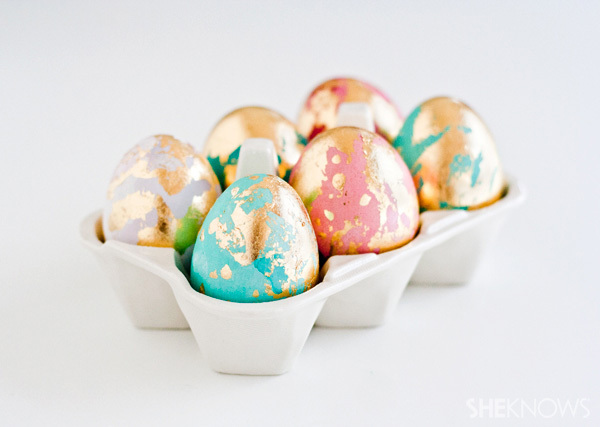 The gold on the confetti eggs looks so festive paired with Easter pastels. And you don’t even need to have amazing calligraphy skills for the calligraphed eggs because Oh Happy Day has a template you can download with cute little spring sayings for your eggs. That’s super convenient and adorable.